to 60%, although the exact figure depends on several factors such as where you live, the size of your house and the fuel you are replacing. The initial investment is relatively low since an air source heat pump, unlike a ground source heat pump, does not require any drilling and most of the time, no planning permission. A Jaspi air source heat pump is up to three times more efficient than a boiler. With conventional oil and gas boilers, 1 kWh of input energy provides less than 1 kWh of output energy. 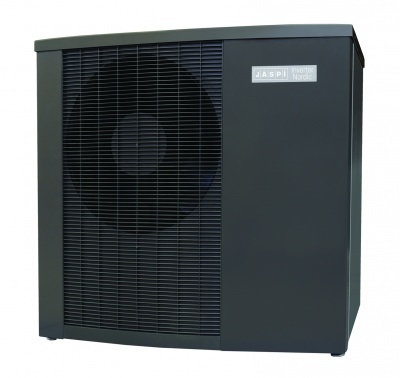 Using a Jaspi air source heat pump every 1 kWh of input energy is converted into a 3-4 kWh of output energy. There is no escaping the obvious conclusion – a heat pump is the absolute best way to get low cost heating and hot water. Designed for extreme conditions. Jaspi Nordic heat pumps can work in very low outdoor temperatures down to -25°C. Maximum output water temperature is 65°C. These heavy-duty air to water heat pumps combine the latest compressor technology, smart controls and ease of installation. They can be installed directly to the radiator circuits or thermal stores, no need to handle refrigerant or install external heat exchangers. These pumps are designed to work at Nordic temperatures with high efficiency and reliability. Lower running noise and intuitive control panel are a further evidence of the quality. High efficiency at low ambient temperatures. The compressor is operated and controlled in such a way as to be efficient even at low ambient temperatures. The JASPI heat pumps are constructed using particularly hard-wearing materials to guarantee long service life even in harsh outdoor conditions. Prevents interference with other electronic devices. Jaspi Comfort has an inverter-driven compressor for a low start-up current. The slow start-up and gradual move up to required capacity prevents interference with other electronic devices in the building. Driven by an energy-saving motor, the fan’s speed varies so only the required amount of air is used. The blades are specially designed to move as much air as possible at the lowest noise level. Delivery includes; Jaspi Nordic Heat Pump, MCU heat pump control centre, ground installation bracket, motorised valve & condense discharge pipe.